This is the main valve off a Volvo excavator. This valve controls the flow of oil throughout the whole machine. 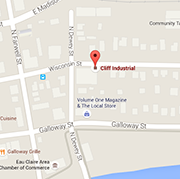 Our technicians at Cliff Industrial are trained in valve resurfacing and sealing. They resurfaced the valve before sending it to the next technician to cut the o-ring grooves to fit the new o-rings. They need to be at a certain depth for the o-ring to stick out, to make a proper seal. 3 of our technicians worked on this at different stages in the operation. It was crucial to communicate what was needed to be done on the valve. If one thing was to go wrong, there was a chance of scrapping a $20,000 part. Our trained technicians completed the re-surfacing and cutting of the o-ring grooves without any complications. Our hydraulic technician repaired both tilt cylinders on a fire truck. We had to take multiple precautionary steps in order to not damage the fire truck. We could not do as little as a scratch in the paint. We covered the truck with blankets where he had to touch, then we built this stand to support the cylinders while he worked. This stand ensured their would be no movement, allowing us to work, without worrying about damaging the truck. We pulled both tilt cylinders off, then replaced the seals and resealed the cylinders. Once we reassembled it, we tested the tilt cylinders to ensure they worked properly. To view more capabilities of our hydraulic cylinder repairs, visit our Hydraulic Cylinder Page. If you are interested in machining or valve resurfacing and sealing, Contact us for a quick estimate!